Photo of Matt Tumlinson in front of his "Neon Flag" mural in Rankin, TX. Photo by Josh Espinoza. 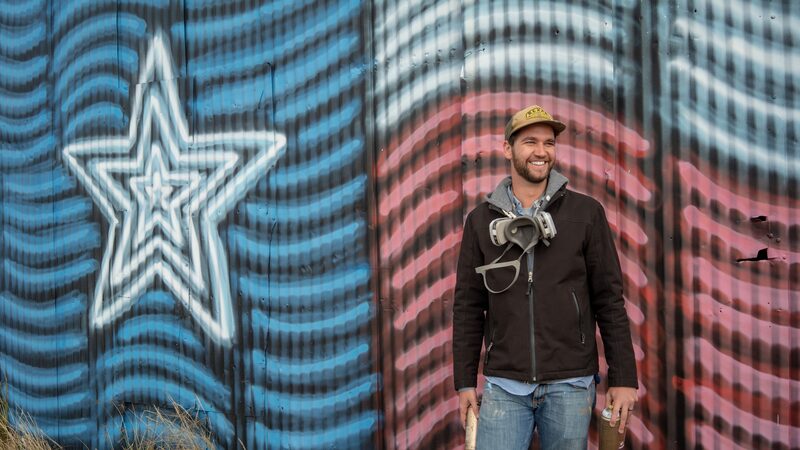 Artist Matt Tumlinson has made it his mission to quite literally “paint the town” of Rankin, a West Texas community with a population of around 800. 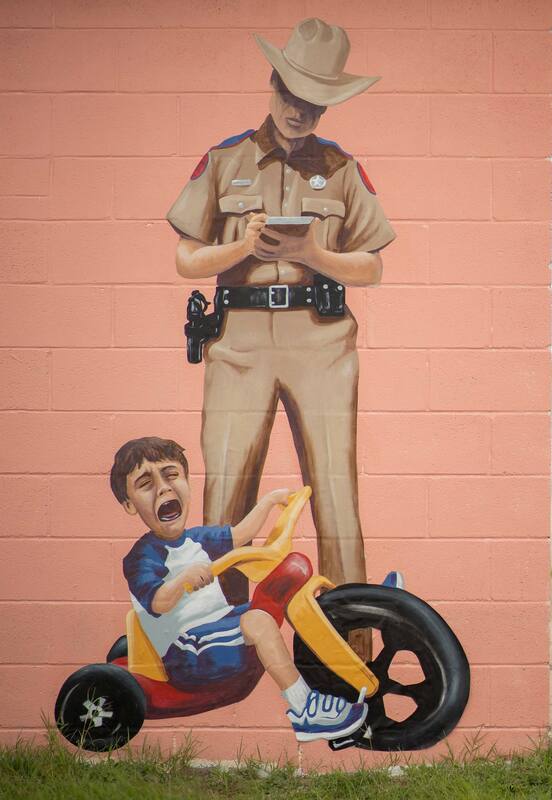 The once-barren walls of Rankin, which lies in Upton County an hour south of Midland, are now decorated with Tumlinson’s quirky murals that often portray a Texan sense of humor. 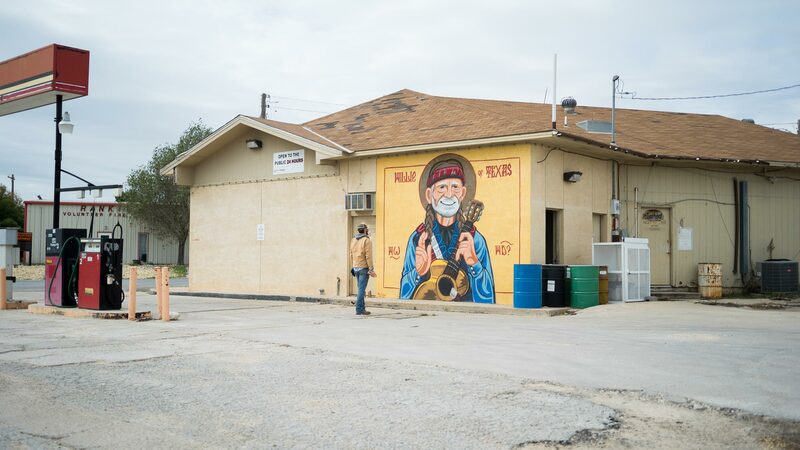 One of his murals is of Willie Nelson painted in the style of Greek religious iconography. 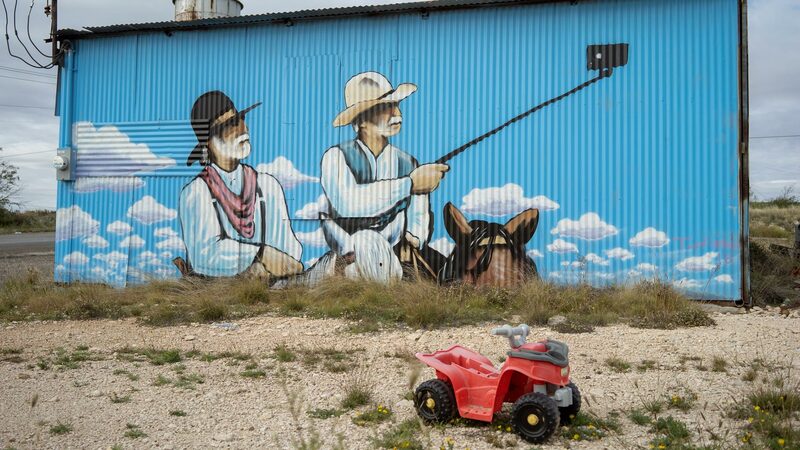 Another that’s “turned some heads,” as Tumlinson puts it, features two cowboys on horseback looking at a selfie stick. 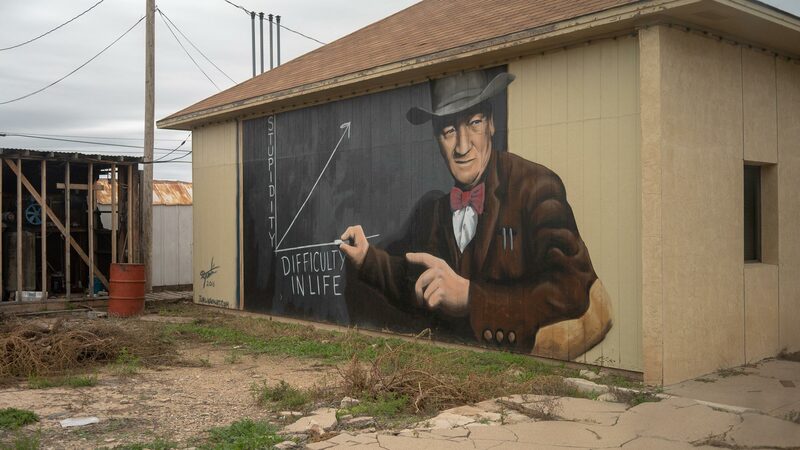 In another, John Wayne dressed a professor depicts his famous quote, “Life is tough, but it’s tougher if you’re stupid,” as a graph on a chalkboard. Tumlinson, a Brownwood native who traces his Texas roots back eight generations, says he’s been drawing for as long as he can remember. He moved to San Antonio to pursue a career as a high school history teacher, but instead found success with his brass canvas paintings, which are artworks on a canvas of discarded bullet casings. From selling those and appearing in a few galleries, he was able to focus on making art full time. His sister, a teacher who lives in Rankin, heard that a restaurant in town was seeking an artist to paint its exterior walls, and she mentioned her brother. 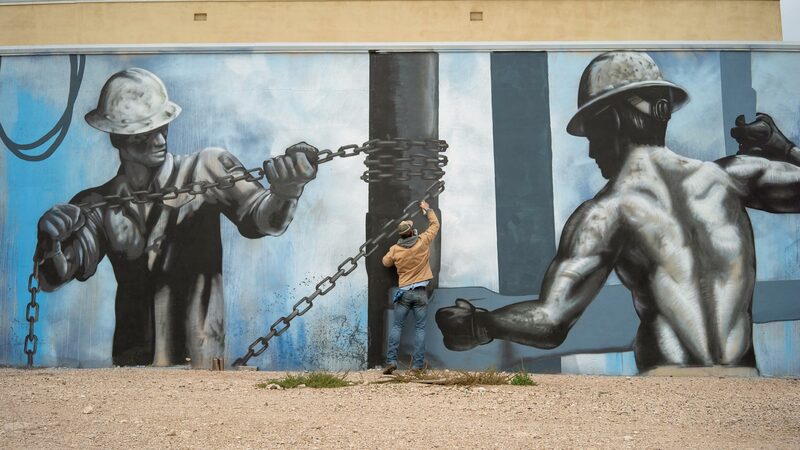 Despite having never painted a mural before, Tumlinson packed up some spray paints and traveled to Rankin, where it took him four to five days to complete the first mural in November 2015: It says “Rankin” with the silhouette of a sunset and depictions of pump jacks and other oilfield motifs representing the region’s main industry. As the mural garnered attention, more business owners offered up their walls to Tumlinson’s deft hand. So far, he’s painted nine murals in Rankin, and he plans on doing 12 more this year. “Sometimes it’s kind of hard to get stuff done because you’re trying to do your job and somebody comes up to you and talks to you for half an hour,” he says. 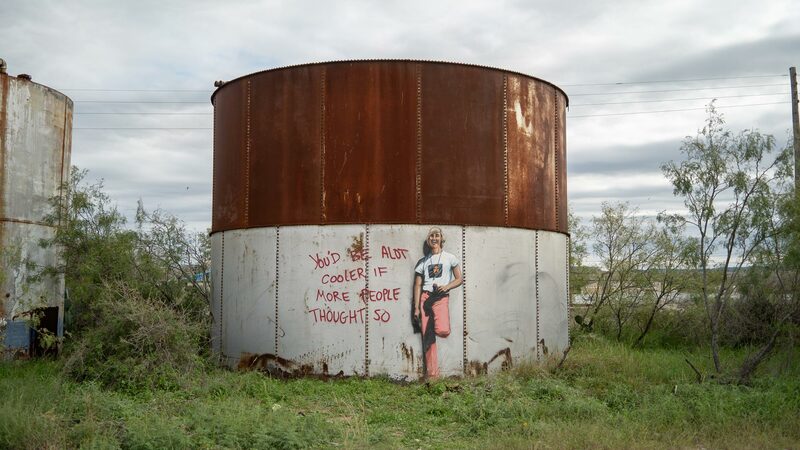 His work has struck a chord with travelers as well, who stumble upon Rankin during road trips and post photos of the murals to Instagram. Tumlinson says his goal is to make it the most painted town in Texas per capita. Currently, there’s one mural for every 100 people, and at the end of the year it could be as much as one mural for every 38 residents. While there aren’t any official stats for “most painted town in Texas,” Rankin surely ranks near the top, despite its low profile (for now) and petite size.